The U.S. federal government reached a record budget deficit in 2009: $1.4 trillion –about one-tenth of the nation’s economic output for the year. No one can deny that’s a deep hole to climb out of. Even relative to the size of the economy, it’s the biggest deficit as far back as the end of World War II, eclipsing the previous mark set in 1983, according to data from the nonpartisan Congressional Budget Office. A weak dollar can put a damper on foreign confidence in U.S. investments, requiring higher interest rates to attract investors and thus making credit more expensive for the U.S. consumers and businesses whose spending drives economic growth. According to economic theory, deficits can help prime the pump during economic dry spells by using public funds to encourage the private spending through which prosperity springs. The tricky part is determining the optimal timing, targets and amount of government spending to get the economy – as well as government revenue – flowing again. Although concerned about the deficit in the long run, Bob says he sees it as no imminent threat to America or American investors. 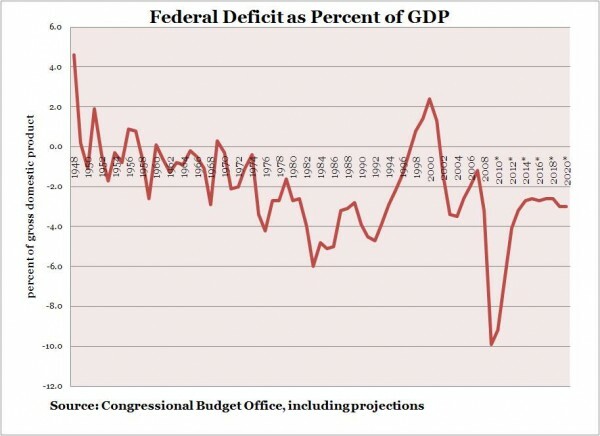 He notes that although deficits are a longstanding problem, they have ballooned recently through a combination of extraordinary circumstances, including an economic downturn through which tax revenue plummeted and government spending on bailouts and stimulus initiatives soared. Although some political pundits have sounded alarmist warnings around the immediate impact of the new record deficit, Bob is among economists taking a longer, calmer view of the situation. A couple of signs that the deficit isn’t a near-term threat, Bob notes, is that the dollar has been rising in value since late 2009 and interest rates on Treasury securities have remained historically low. In fact, core inflation – which takes out the volatile food and energy categories – actually fell in January, the first time that has happened since 1982. Through April, the 12-month core inflation rate of 0.9% was the lowest since January 1966. Though she has warned against deficits her whole career, Janet Yellen, president of the Federal Reserve Bank of San Francisco, has said that the current deficit poses no inflation threat. Still, Bob says, current domestic budget problems underscore the need to include global assets in a broadly diversified investment portfolio. Economic growth will help close some of the gap as revenues increase and the need for stimulus subsides. 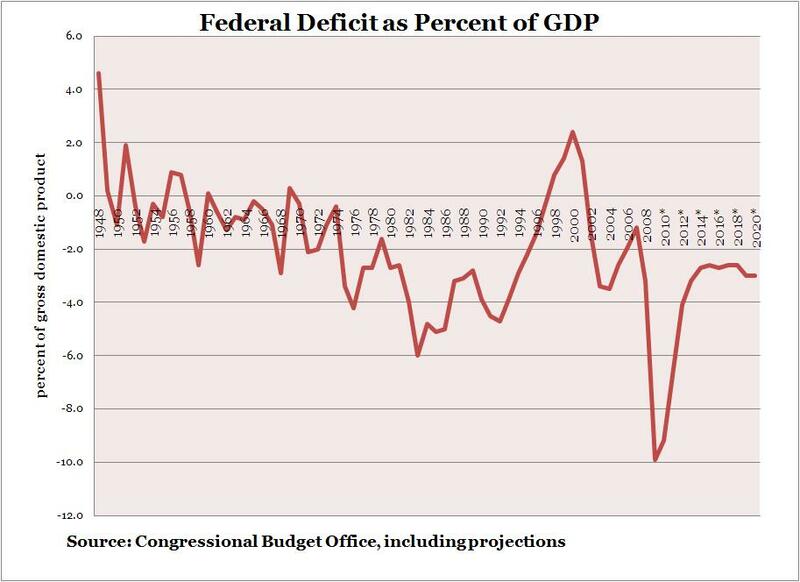 The Congressional Budget Office has projected that within a couple of years, federal deficits as a share of economic output will be back to where they were around 2005.